In the film, Groundhog Day, the lead character, played with perfect disaffected snarkiness by Bill Murray, gets trapped living a single day over and over again. 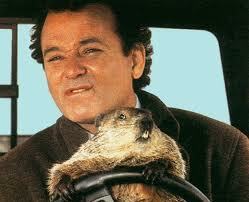 Every day is Groundhog Day; a cold, gray, mediocre one in Puxatawney, Pennsylvania. Each day, Murray steps into the same hole at the curb filled with icy water. Each day, Murray gets rejected by the beautiful, kind Andie MacDowell. When I ask my psychotherapy clients to imagine their worst possible life 3 years from now, they almost inevitably say that their life would look exactly as it looks today. Their greatest fear is of being stuck, just like Murray. So how do you get out of living the same day over and over again? At first, Murray has a hard time accepting that this is his life. The first step in making things different is recognizing how things are. This realization that his life is a nightmare from which he can’t escape sends him into despair. This leads him to confront the meaninglessness of his life. What difference does anything make if it will all be erased when he wakes the next day only to go through the motions again? He tries every way out of his life– even through suicide, but this, too, leads to nothing but repetition. Then Murray moves to acceptance. If he’s stuck here, he might as well make the best of it. He comes to discover that making the best of being stuck here is being good to others. He saves a restaurant patron with the Heimlich maneuver, even though the guy will choke on his steak the next day. He feeds the homeless guy even though he’ll be broke and hungry the next day. He learns to play the piano — with all the time in the world, why not? With endless practice, he knows the day so well, and everything that will happen in it, that he is able to create a perfect day for all the residents of Puxatawney. He is kind to all. He makes everyone happy. Unwittingly, he stops being a jerk and becomes a great guy. Naturally, Andie MacDowell falls in love with him. Not only does everyone else have a great day, but so does he. And guess what? He wakes up the next day, and his long nightmare is over. It’s a new day. What’s the lesson in this movie for us? Everyone wants their life to be different, but so few of us want to do the hard, scary work of change. Most of us, though our biggest fear is being trapped in Groundhog Day, end up living lives of low-level, repetitive misery. So what to do? The movie’s message is an existential one. There may be no grand purpose to our universe, and no guarantee that things will go how we wish. Most people might be jerks, and love can be hard to find and hold onto. The economy is unjust, and we are all oppressed by a system run by crooks and liars. Sure, the world can be crappy. But then we are left with a choice. Who do we choose to be, in spite of the meaningless, difficulty, and injustice of everything? How do we want to make our own lives? Do we, as religious philosopher Paul Tillich put it, have the courage to be? Murray makes the choice to create happiness – for others – and therefore for himself. We may not get a reward in heaven, but we get a reward right here on Earth, in our own lifetimes. We need to realize that everything we do has meaning, because we give it meaning, and because it effects everything in the universe. Each one of us only has this one infinitesimely small speck of universal time and space to be alive, to be conscious, to choose. Most of us, in our semi-awake state, don’t realize that we are wasting this extraordinary gift when most of the rest of the universe will never say “I love you.” Most of us ignore the joy of the day we are living. As Albert Einstein purportedly said, the definition of insanity is doing the same thing over and over and expecting different results. The solution isn’t getting out of your life. It is getting into your life, fully and truly. If you want the day to change, if you want your life to change, you need to change. Now.